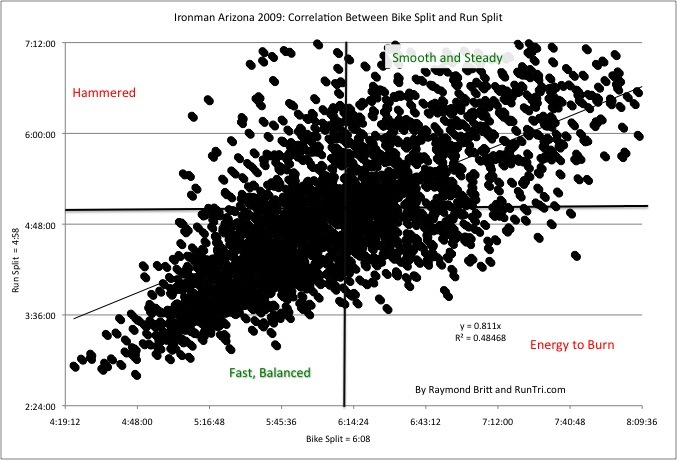 At Ironman Arizona 2009, if you rode a 6:09 bike split and ran a 4:58 marathon, you struck the perfect balance. Another way to look at the equation, at least on the Ironman Arizona course: average marathon time = 81% of your bike split. Those in the upper left quadrant generally left it on the bike course, burned out on the run. Conversely, those in the lower right ran better than expected after a slow bike split. The others: smooth, steady, solid balance, and comfortable finishes. Also see Bike Split Times/Speeds Per Lap by Age Group, Ironman Arizona Average Finish Times and our Complete Ironman Arizona Coverage.